I feel it is my duty to bring you all the grave news that the Augmented Reality crisis is indeed spreading. 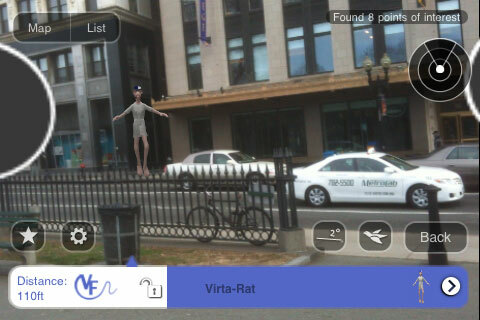 What began as a rather whimsical, even playful experiment into the migration of the public sphere into the augmented virtual world by a rogue group of outsider artists, has taken a dark turn indeed. My office informs me that toxic waste dumps have been discovered all along the L line in Bushwick with reports as far west as the Bedford stop. Even more disconcerting is recent international press coverage of a similar phenomenon in at least three locations in Paris. This would seem to confirm our fears that the outbreak has indeed spread to Europe. I believe that it is imperative that the French media be alerted so that the public can be adequately informed and take necessary safety precautions. The Border Memorial: Frontera de los Muertos at the Buskwick AR Intervention. Mark Skwarek, John Craig Freeman, with Will Pappenheimer. 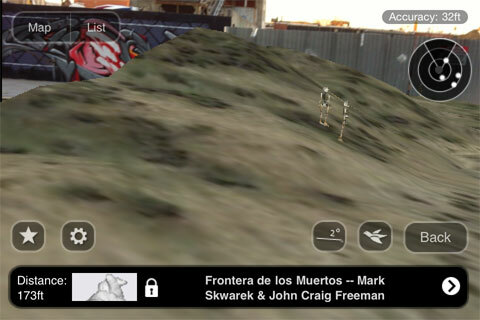 The Border Memorial: Frontera de los Muertos, is an augmented reality public art project and memorial, dedicated to the thousands of migrants who have died along the U.S./Mexico border. Built for smart phone mobile devices, the project allows users to visualize the sites where human remains have been recovered. The public can simply download and launch the Border Memorial: Frontera de los Muertos app and aim their mobile device cameras at the landscape along the border. 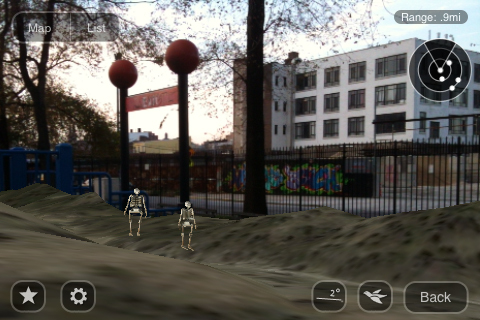 The application uses geolocation software to superimpose computer generated 3D graphics of a traditional skeleton wood-carving, or calaca, at the precise GPS coordinates of recorded migrant deaths, enabling them to see the calacas integrated into the physical location as if they existed in the real world.We hope that in some cases this project might give solace to the family and loved one of those who have died and assist them through the mourning process. Just as importantly however, this project is designed for the citizens of the United States and intended to impact the formation of national identity by remembering the sacrifice which has been made on behalf of our shared values. We feel that the time has come for this nation to acknowledge the role we play, both individually and collectively, in creating the conditions for death at this scale to occur, and to own up to the economic benefit we have reaped by maintaining a cheap, marginalized, undocumented migrant workforce in food production, child care, manufacturing, building, domestic maintenance, tourism and virtually all other aspects of our economy. In the Buskwick AR Intervention, The Border Memorial: Frontera de los Muertos was placed at 2 locations. 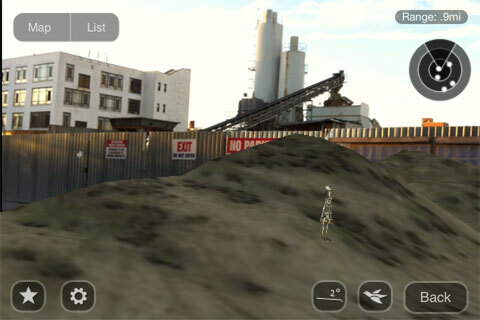 Viewers were able to walk through a scale copy of terrain from the US Mexico border where migrants passed away trying to enter the United States. "The Border Memorial: Frontera de los Muertos" installation at McKibben Park where it overlayed the park allowing viewers to walk through the project. Documentation by Mark Skwarek and Will Papenheimer. The Border Memorial at McKibben St. industrial sand supply behind. Documentation by Will Pappenheimer and Mark Skwarek. For more on the The Border Memorial: Frontera de los Muertos see the full project description and the project blog. 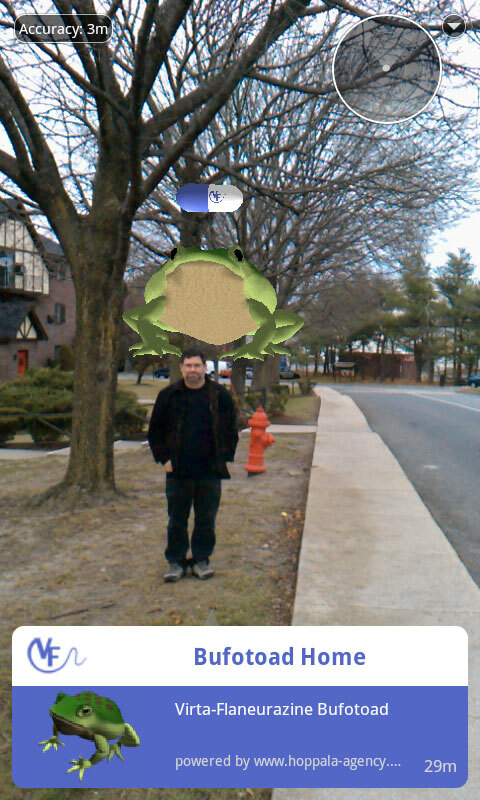 Virta-Flaneurazine, Bufo Virtanus with Hallucinations, at the Buskwick Augmented Reality Intervention. Will Pappenheimer and John Craig Freeman, with Mark Skwarek. The important lesson we might take from the Virta-Flaneutazine Bufotoad outbreak, is that it exposes the permeability of the institutional immune system. We are not sure if this posses any threat to public class and social order, but we understand that the Centers for Rube Control and Prevention in Atlanta are investigating the situation. In 2008, researches at the Virta-Flaneurazine Laboratories identified a hardy specimen of bufo virtanus for release it on a test parcel near the Virta-Flaneurazine clinic for research purposes. With no natural predators and an abundance of suitable habitat, the Bufo Virtanus soon reproduced vigorously and began spreading to neighboring SIMs. In July of this year researchers were startled to find that some Virta-Flaneurazine dosage tests resulted in an unexpected breaching of the software barrier beyond virtual worlds and into other online social networks. Although the exact cause of the most recent breach into augmented space is little understood, we can assure your readers that we are doing everything scientifically possible to address public concerns. Although our licensing agreement and lobbying efforts protect us from liability in the matter, eradication efforts are under way. In the meantime, we would discourage touching the toads until we know more about the effects of its toxin under augmented conditions. Ingestive contact, commonly known as “licking toad,“ runs the risk of severe neurological effects such as paralysis, seizures, blurred vision, and dizziness. For more on Virta-Flaneurazine see Will Pappenheimer’s page on this site, the full project description and the project blog. Please send screen captures to john_craig_freeman at emerson.edu. I will post them. The clearness to your publish is simply cool and that i could assume you’re a professional on this subject. Well with your permission let me to take hold of your RSS feed to keep updated with imminent post. Thank you a million and please continue the rewarding work.